Although the terms "carpet" and "rug" are often used interchangeably, the two are very different products. While carpets usually extend across the entire floor from wall to wall and are secured in place, rugs only cover a specific area of the floor, are used under a table, or to define a conversation area in a living room. While ultimately the decision is yours to make, both products offer advantages and disadvantages. A textured area rug covering the floor of a contemporary living space. A striped area rug beneath a table in a modern dining room. As a traditional way to cover a wood, tile or colored cement floor, rugs add artistic appeal and stylishness because of their many designs and colors when compared with carpeting. Rugs help to define a specific area in the room, allowing you to easily switch your decor scheme, the room's arrangement or appearance simply by changing it. When used in a large open floor plan, a well-placed rug can bring together dissimilar furnishings to create a more cohesive look. 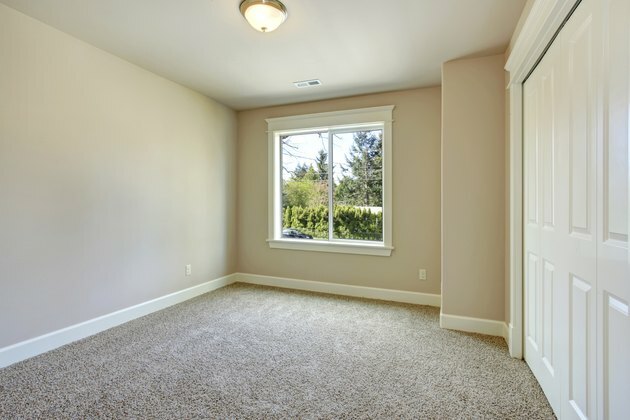 A remodeled room with wall to wall carpeting. Carpeting secured to the floor with glue and tacking strips doesn't move or create slip, trips and falls for the home's occupants as a rug can. When used in coordination with a design or decor scheme in the home, wall-to-wall carpeting unifies the different rooms in the home and can make a small home seem larger. Besides these benefits, carpets add a layer of insulation and warmth to the floor, especially helpful in homes with crawling children or the elderly. 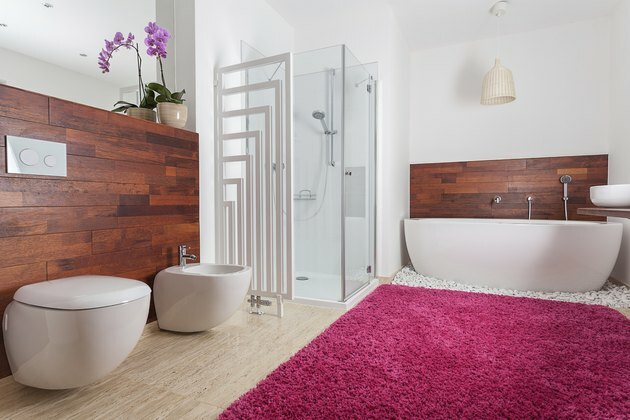 A plush colorful rug on the floor of a natural bathroom. Since you can more easily wash and dry them, rugs may make a better choice for those with allergies. With a rug, you can have a hardwood or tile floor, but still retain some warmth by covering it with a rug where needed. But unsecured rugs can become a tripping hazard or be responsible for slips and trips when compared with wall-to-wall carpeting. In homes with the elderly, a trip on an area rug can become a life-threatening event. 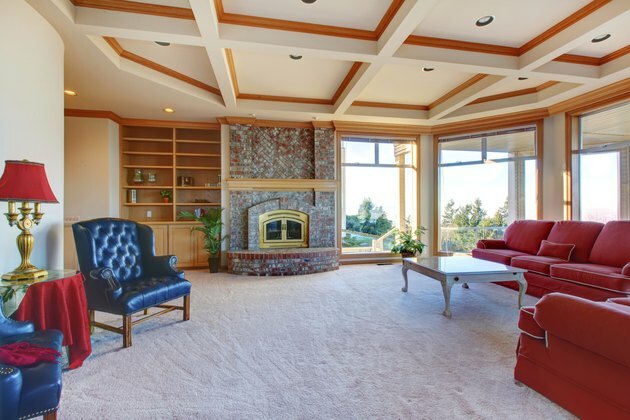 Wall to wall carpeting in a traditional livingroom. Wall-to-wall carpeting offers slip and trip resistance, warmth and cushioning beneath the feet when installed in the entire home, especially when it has a memory foam pad beneath it. While you can choose from carpets with designs and different types of pile, neutral color-carpeting helps to create a sense of cohesion in a space. One major drawback to carpeting is that right after it is installed, it can take several months for the off-gassing -- offensive chemical smells -- to dissipate. 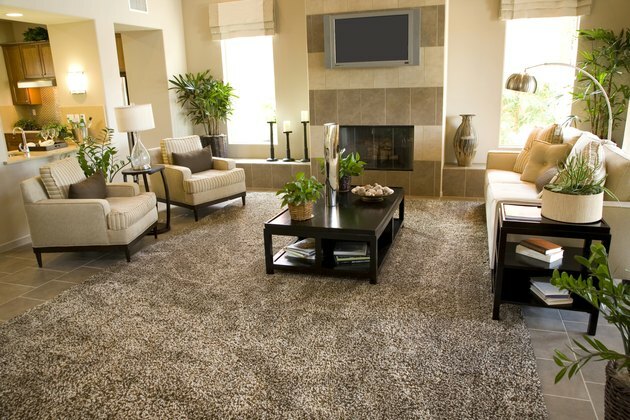 And carpets develop wear patterns in heavy traffic areas and take more work to keep clean. What Causes Wall-To-Wall Carpeting to Buckle?